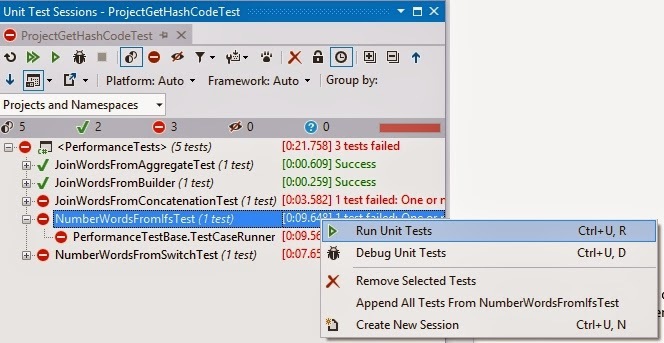 In this post I’ll introduce a set of performance testing classes and practices that I use when creating automated performance tests – with one main aim: simplify the task of measuring/verifying the performance of key areas of my .NET applications. Often it is not practical, nor even recommended to measure all parts of an application – why waste time profiling sections of code that get called infrequently? It’s also rather difficult knowing exactly where to start profiling an application, whether it’s server or UI, when that app either hasn’t had performance proactively “baked in” or when you’re trying to find the root cause of an occasional freeze. If I’m trying to isolate performance issues (or maybe retrofitting performance tests), then I tend to start off by using any of the popular . NET profiling apps, such as Red Gate’s ANTS. These give me an idea of where to look, eg for methods that are called very frequently or take a while to run. At least this gives me a fighting chance of where to concentrate my efforts, rather than wading through 1000s of lines of code…needle in a hay stack springs to mind. I’ll not delve further into the specifics …will leave that for another post; another day. I treat performance tests as being just as important as my unit tests (which, to me, are of equal importance to my actual project’s code). The performance tests must be easy to run, allowing me to tweak the code under test, run the performance test, and should tell me as soon as a timing metric has not been met…a red alert followed by a fail. If you’re familiar with the red/green/refactor mantra from the Test Driven Development world, then you’re probably used to seeing red/green alerts whilst you work through a project. By following these steps, I have an initial benchmark to work from and will know pretty quickly if I’m actually making things worse, or if the incremental changes are starting to make less of an impact on the results (when this happens it’s generally time to stop trying to squeeze the last clock tick out of a method). The benchmark can then serve as future indicator of performance. If, sometime later, a developer makes a change to an area of code which negatively affects the performance, the performance test will fail - much like a failing unit test. Unfortunately, there are many factors that can affect how long a section of code takes to run, eg JIT overhead, other applications running, IO activity, debug/release build, physical/virtual memory, type of hard drive, number and speed of processors. All of these come into play and unfortunately it’s not possible to eradicate any as a factor of the timing stats. To try to alleviate this, the performance test should run the code under test a number of times and calculate a meaningful statistic from that. Gotcha: This problem is made even worse if you run the performance tests as part of a Continuous Integration on a build machine. Your build machine may be used by other dev teams or may be lower spec than that of your development or end user machines. Performance tests that run without failing on your development machines may well fail on a build machine. As it happens, I could have just thrown an exception to indicate an error state for the test, but NUnit has so many useful features I’ll stick with the using NUnit’s Assert class. This is an abstract class, which I’ll base each of my specific performance tests on – so one test class for each method/block under test. As an example, say I’ve established that the GetHashCode function on my Customer class needs to be profiled, then I’d create a class called CustomerGetHashCodeTest – which will contain all of the code to test just GetHashCode. /// TIMED: The actual test that you want to run per cycle. 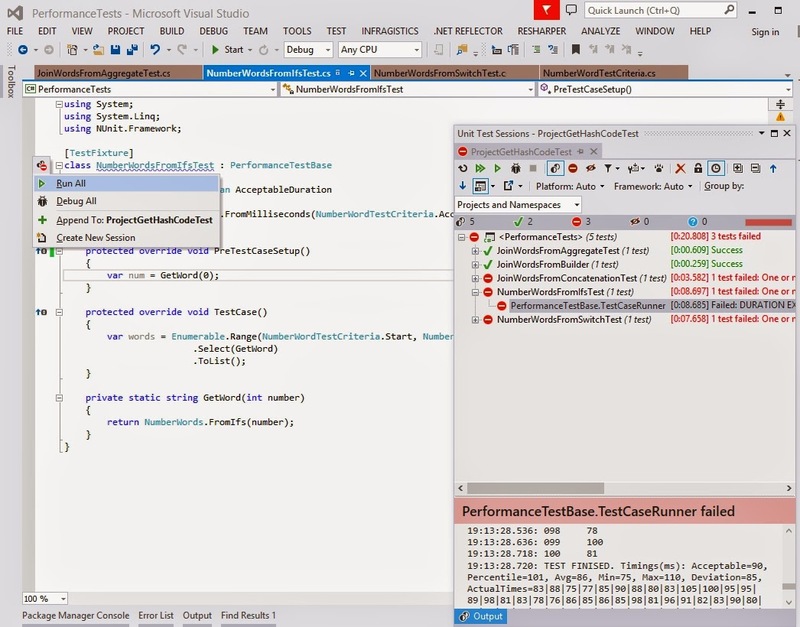 Contains the actual test code to run – this method call is timed and is used to calculate an overall average. We use a StopWatch instance to provide the actual timing element, simply starting, stopping and resetting the timer between each cycle – this provides a high-enough resolution. The remaining Log and AssertStatistics methods need to be defined. Log is simply a helper to log messages to the console. AssertStatistics() uses a few extensions methods that extend ICollection<TimeSpan> from a class called TimeSpanCollectionExtensions.cs (below) . These methods determine the minimum, maximum, average, deviation and most importantly the Percentile value from the timing stats collected after each cycle. In order to determine if we’ve exceeded the acceptable time space, compare that with use the 95th percentile – this is more accurate than using the average value. FromSwitch() and FromIfs() return exactly the same thing, they highlight the performance difference you might see between the two implementations. 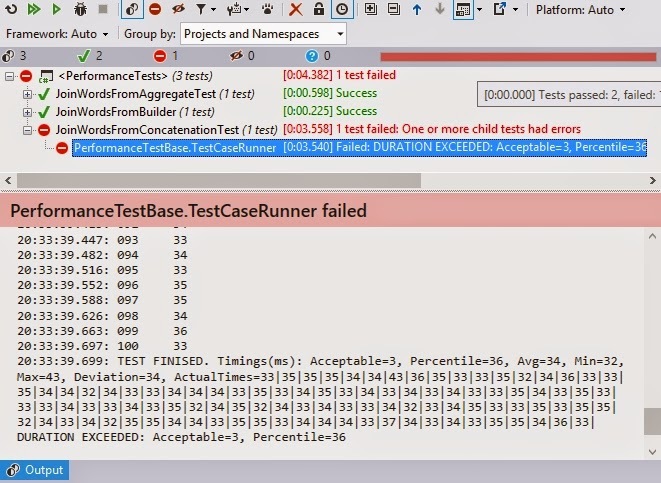 Looking at NumberWordsFromIfsTest, the class derives from our base performance class PerformanceTestBase and is decorated with the TestFixture attribute so that NUnit runners can find the test. The abstract AcceptableDuration property is implemented – I want this to pass if the average time span is less than 90 milliseconds. I’ve also implemented PreTestCaseSetup(), this will get ran prior to running my TestCase method – the method under test. You can generally use this approach to negate the effect of CLR JITing when a method is first called. TestCase is the method that gets called repeatedly and its execution time averaged out to see if I’m improving or degrading performance. 20:20:03.824: TEST FINISHED. Timings(ms): Acceptable=90, Percentile=113, Avg=87, Min=70, Max=123, Deviation=87, ActualTimes=114|78|80. So now it’s up to me to find a faster way to concatenate the words. Again, each of the three methods do the same thing, they return a string of numbers joined together, using a StringBuilder, string concatenation and a StringBuilder in conjunction the Linq Aggregate method. It’s interesting to see just how slow string concatenation runs compared to using the StringBuilder – ten times slower. MaxMunus Offer World Class Virtual Instructor led training Nunit . We have industry expert trainer. We provide Training Material and Software Support. MaxMunus has successfully conducted 100000+ trainings in India, USA, UK, Australlia, Switzerland, Qatar, Saudi Arabia, Bangladesh, Bahrain and UAE etc. Hi, Great.. Tutorial is just awesome..It is really helpful for a newbie like me.. I am a regular follower of your blog. Really very informative post you shared here. Kindly keep blogging. If anyone wants to become a .Net developer learn from Dot Net Online Training from India. or learn thru ASP.NET Essential Training Online . Nowadays Dot Net has tons of job opportunities on various vertical industry. I found your blog while searching for the updates, I am happy to be here. Very useful content and also easily understandable providing. Believe me I did wrote an post about tutorials for beginners with reference of your blog.